We've been happy to be a Test Drive Family for the new Frigidaire refrigerator the last couple months. As I mentioned a couple weeks ago, I love being able to have crushed ice at the push of a button! I thought you might like a peek into our freezer today! The front panel shows me that it keeps a steady temperature of -2 degrees Fahrenheit, which is good because it keeps our boxes and boxes of Popsicles nice and frozen! This is the top of the freezer. In the top drawer shelf is our collection of ice packs. Whenever a kid around here gets a bump, they get an ice pack. It saves on Tylenol and makes everyone feel better. Yes, even the green turtle is an ice pack -- he has a gel pack built into his tummy. 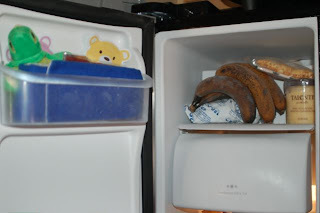 Above the ice maker you can see another ice pack - but this one is for the cooler - a bunch of ripe bananas that I'll make into banana bread as soon as it's not 117 degrees outside, a container of expensive sorbet that I bought on impulse, and a Hot Pocket. Moving down the freezer -- you can see that there are plenty of shelves! The door shelf below the ice/water dispenser folds out for easy access. I have a shake drink, an extra pound of butter, and an lemon ice cup in that shelf. Below, there are 2 cans of apple juice and another ice pack. And, finally, Lydia's leftover smoothie. It's hard to see, but those 2 shelves below the icemaker? Popsicles, Popsicles, Popsicles, more Popsicles, cherry ice cups, ice cream bars and frozen chocolate chip cookies. Yes, I have 2 entire shelves dedicated to frozen treats. The next 2 shelves are actually drawers that pull out so that it's easy to see what's hiding. I have a couple bags of frozen vegetables, frozen chicken nuggets, homemade spaghetti sauce, and 3 bags of frozen fruit. As you can see, there is plenty of room for my family of 5 and our freezer needs! 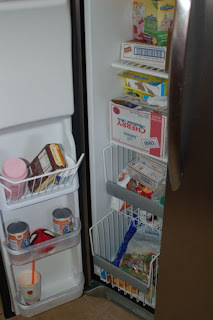 There is plenty of room for more, but I do have a 2nd upright freezer in my laundry room where I freeze meats, more vegetables and I think even another box or two of Popsicles. (I buy them on sale.) Since I try to buy in bulk when I find good prices, it's useful to have a second freezer. Have you visited the Frigidaire site lately? Don't forget to head on over and enter the Daily Dare for a chance to win new appliances!